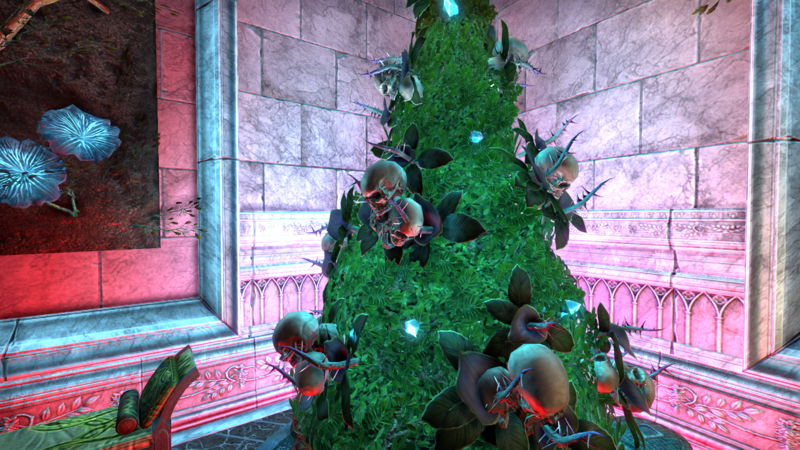 How to save crowns and still have a great Christmas tree! Go to the furnisher in Skywatch, Auridon. Decorate with whatever you have! 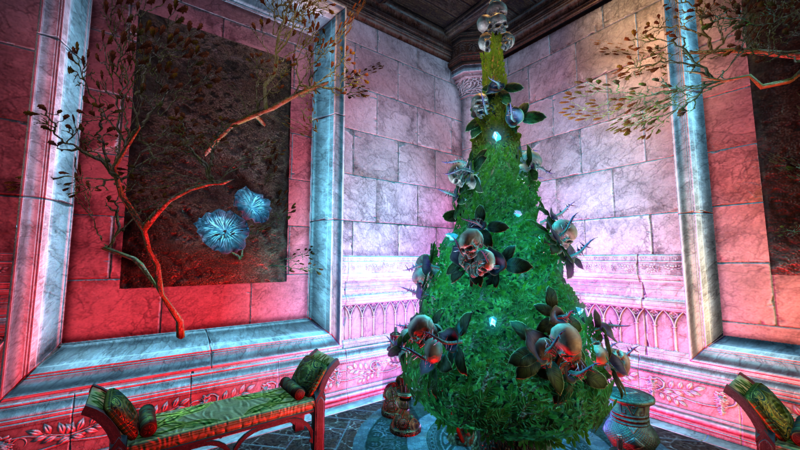 I am always open to new ideas on how you celebrate Christmas in ESO, So I would love suggestions! Looks amazing and thanks for this tip. That festive crown store pack was looking tempting (but having to buy $50 in crowns eeek). Really wanted a Christmas tree in my new home and now I do, even if it's only with basic candles for now! The orange and green is really cheerful. Shame you can't make single oranges to use, really. Apples make pretty good decorations, too. 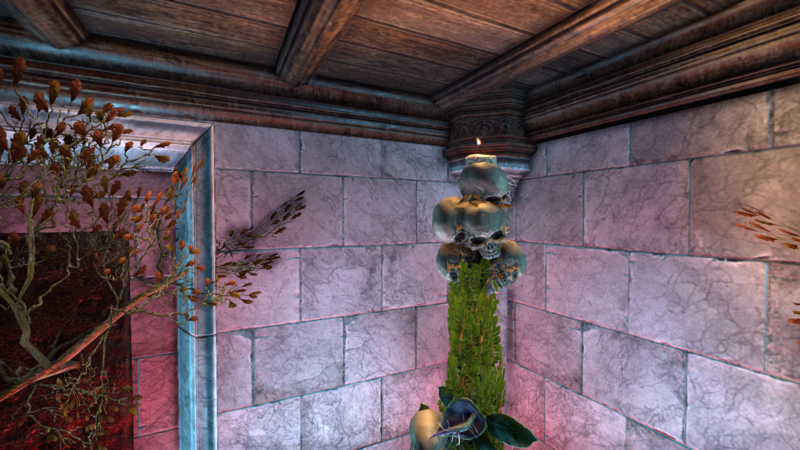 I'm lucky enough to have a couple of New Life Trees (someone, very kindly, gifted me one of them), but in the case of the one I'm decorating now, in Old Mistveil, I have the spare furnishing slots to add a few apples. Actually, it's a shame they didn't provide baubles, fairy lights of some kind and a star (or some other decoration) for the top of the tree. If you could also buy those separately (or in packs of, say, 14 for the baubles), that would be good. There would still be reason to buy the New Life Tree, as it's more like a real Christmas Tree and far more convenient than having to start from scratch (not to mention, only takes one furnishing slot), but it would mean that people, who didn't have the crowns for the tree/pack, could still have a very nice tree. Also, even if you did buy a New Life Tree/Pack for your main property, you could (with a more modest crown purchase) still use the other trees for your other properties (slots allowing! ), if you wanted. "Momma! May I open my New Life gift from Uncle Sheo now?" "Of course dear, but don't let the tree eat you again like last year." And they heard him exclaim, as he drove out of sight, "CHEESE AND CABBAGE FOR ALL!" Tip: crafting single apples makes great round red ornaments (they really don't look like apples).